I got a text from my mom that she was really liking the Shea Moisture shampoo and conditioner I’d recommended to her when I was visiting her in Louisville this summer. 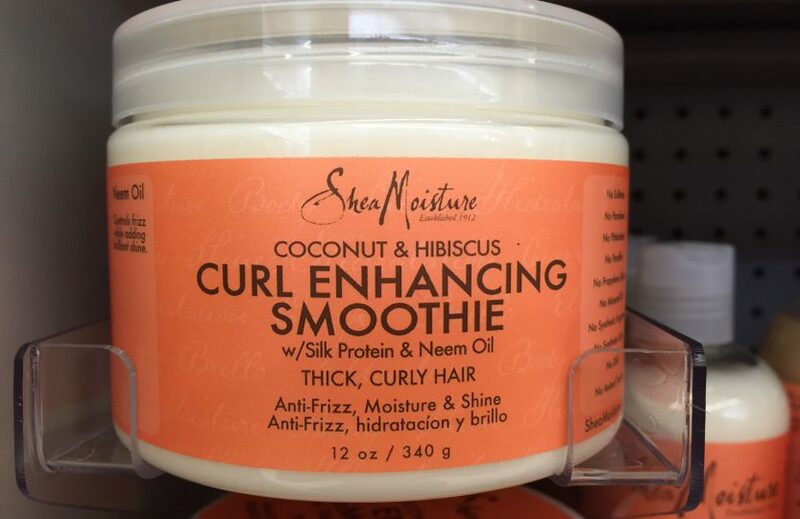 But she said she had to stop using the Shea Moisture Curl Enhancing Smoothie because it was really drying out her hair. Oh no I thought, did I recommend a crappy product to my mom? Was there some ingredient I didn’t know about that was drying and so was obliviously recommending and using? So I asked her if I’d recommended the Smoothie (as I sure couldn’t remember doing it, but you never know), and if she’d mind sending me a picture of the ingredients. She wrote back and said no, I hadn’t recommended it to her, but since she liked the shampoo and conditioner so much, she (mistakenly) thought the Smoothie would be great. And she sent me a photo of the ingredients. I went to my local Rite Aid to see if the products here had the same ingredients as the ones there (I was noticing products in Louisville stores often had salt or a hydroxide in them they didn’t have here, which made what I could recommend to my mom quite limited). Yep, we had the same ingredients. And the drying culprit jumped out at me: ammonium salt. I feel totally justified in my salt paranoia now. And this just goes to show that just because a product line has one great product, it doesn’t necessarily mean any of the other products in their line are any good.